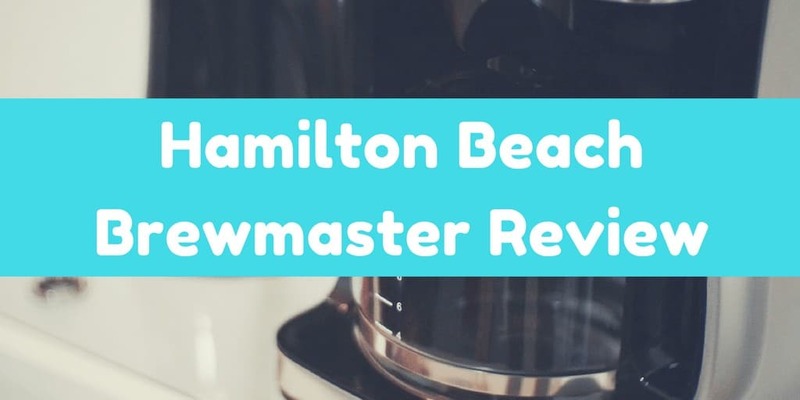 Hamilton Beach 48465 Brewstation Review – Worth Buying? If you enjoy a carafe of coffee but not the burnt flavors of hours on a hotplate, the Hamilton Beach 48465 Brewstation could be the answer. Its innovative internal tank means you get up to 12 cups ready to go at the touch of a button. And as the coffee is kept away from the air, it stays fresher for longer. Check the height of your kitchen cupboards, though, before you buy. You’ll need plenty of clearance to empty and refill this machine. Looking at reviews on the internet, it seems that lots of people love their BrewStations. There are plenty of videos showing how to use it, and this YouTube reviewer particularly liked the timer feature. If you have a household of coffee lovers, you need a machine that can handle the demand. Single cup servers are a great option – but pods can be expensive and bad for the environment. If you’ve faced this dilemma, consider a single serve machine that doesn’t use pods. Yes, they do exist: and the Hamilton Beach BrewStation is one to consider. We’ll look at who this type of machine will suit, then take you through its features. Related Post: What's the Best Siphon Coffee Makers? No-pod machines are great if you want fresh coffee, good and hot. They don’t create lots of waste pods for landfill, and you’re not restricted to pricey capsules from one manufacturer. You can use whatever coffee you enjoy, and even grind your own beans for a fresher taste. You will, though, have to do a bit more work. Instead of popping in a pre-measured capsule, you’ll have to fill the filter basket yourself. And there’ll be grounds to dispose of, which are invariably messier than a compartment of used pods. You’ll have to wait a bit longer for your first cup too. You’re effectively making a carafe of coffee (1), just inside the machine. Expect to wait about five minutes. On the other hand, if you like carafe-based machines, there are some potential downsides. You won’t be able to enjoy the communal spirit of passing a carafe around the breakfast table. And there won’t be anything shiny to sit next to the milk jug! On the plus side, there’s no need to worry about spills or breakages. So if you tend to “grab and go” in the morning, this may be a better option. 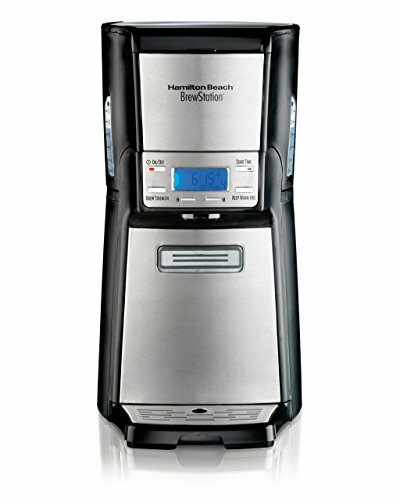 Hamilton Beach present the BrewStation as an evolution of their brewing technology. They’ve made umpteen machines with carafes and hotplates over the years. But now they’re finally ready to admit it: hotplates are bad for coffee flavor. A carafe of coffee sitting for hours on a hotplate means a stale, burnt taste. It will still be hot – but who wants hot, stale, charred coffee? 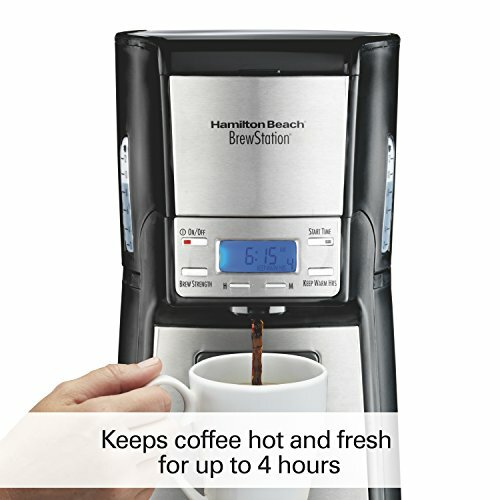 The BrewStation deals with this by sticking to the Hamilton Beach formula of brewing a carafe. The difference is that here the carafe is actually a reservoir that sits inside the machine. The air can’t get to it and it can be insulated without “cooking” the coffee. The marketing is designed to attract new customers whilst being familiar enough to avoid losing existing devotees. It’s a clever tactic: but how does the BrewStation perform? It’s not the smallest machine out there so it’s just as well that the BrewStation is good-looking. Get the version with the stainless steel backplate at the bottom for maximum countertop presence. There’s an attractive backlit LED display, which also allows it to double as a kitchen clock. Beware of the dimensions though. It’s 16 inches tall and you’ll also have to open the top to prepare it for use. The rubber feet will be a pain if you have to move it from under wall cupboards to do that. The BrewStation will brew up to 12 cups, and there’s also a 10 cup version for smaller households. That should see you through a family breakfast. Alternatively, if you live on your own, you’ll have hot coffee to keep you going throughout the day. You can decide to brew smaller amounts too. There’s a “one to four cups” option for smaller servings. Just add the correct amount of water and the machine will do the rest. There’s a gauge on both sides of the machine so you can see how much coffee is left. It’s marked at two cup increments, but beware: the cup measurements aren’t generous! Two cups on the gauge will give you only about 10 to 12 ounces of coffee. If you like a bigger mug, assume you’ll need two cups to fill it up. The BrewStation has a number of clever options. First of all, you can set it to brew at your chosen time up to 24 hours in advance. If, like us, you love waking to the delicious aroma of coffee, this is a great feature. There’s also an auto-off function. Programme the machine to switch itself off when everyone’s left for work, and you’ll save on energy costs. You also have options when it comes to the flavor of your coffee. You can choose from bold and regular – and unlike some other machines, there’s a noticeable difference between the two. If it’s a hot day there’s an iced coffee setting too. Just remember that you’ll still be brewing a whole carafe at your chosen setting. 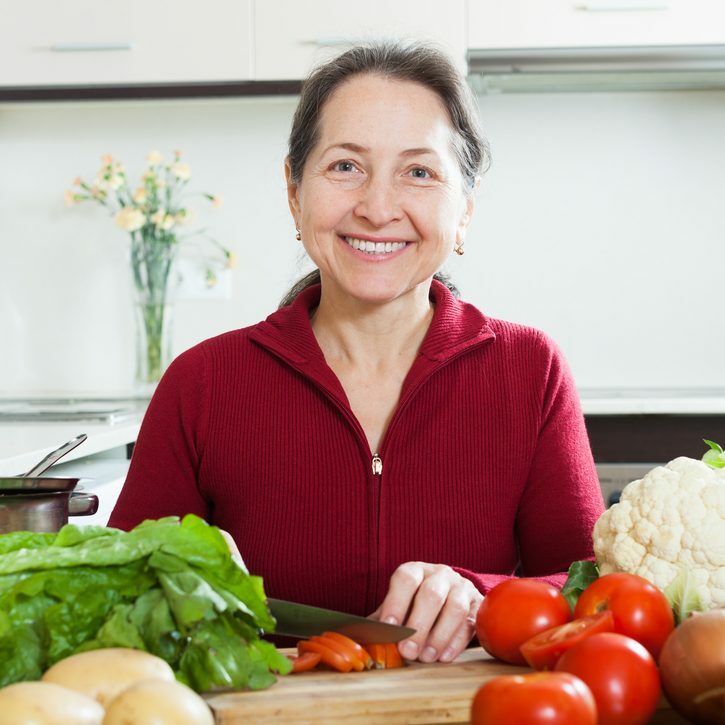 If you’ve got different preferences in your household, someone will need to compromise. Separating the BrewStation from other coffee makers is the way it replaces a carafe with an internal reservoir (2). This is well insulated with what Hamilton Beach describe as a “gentle heater” to keep it warm without impairing flavor. You can programme the machine to keep your coffee warm for anything up to four hours. This sounds great – but however good the engineering, the laws of physics still apply. Avoiding burned flavors means that the heater really does have to be “gentle”. Even so, applying heat to already brewed coffee will have some impact on flavor. That means two things will happen the longer you leave the coffee. It will get cooler, and the flavor won’t be quite as fresh. That doesn’t mean you’ll get a bad cup of coffee. It will certainly taste far better tan alternatives that have been left on a hotplate for hours. It simply means you shouldn’t expect coffee brewed three hours ago to be just as good as a cup brewed in the last five minutes. 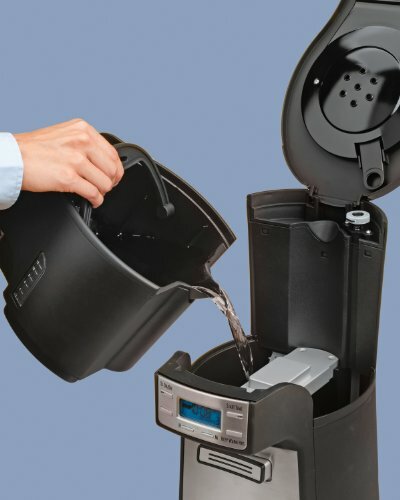 The BrewStation couldn’t be easier to use when it comes to dispensing your coffee. Just press your cup against the dispensing bar, and the machine will pour until the bar is released. There’s no danger of mess or spills. And those of us who’ve broken more than one carafe in the past won’t have the same problem here. If you’ve got a piece of toast in one hand and your coffee cup in the other, it’s ideal. If you prefer to linger around the breakfast table with friends or family, though, you might prefer a carafe. The BrewStation comes with a one-year, limited warranty. Frankly, it’s not the best. You can get repairs or a replacement in that year, but you’ll be stuck with the costs of shipping. There are options to purchase an extended warranty from some retailers. This isn’t an expensive machine though, so you may not think the extra cost is justified. If you don’t mind using pods, Keurig’s classic K55 is a good single-serve option. It’s around the same price as the BrewStation and you’ll get fresh coffee at the touch of a button. If you have deeper pockets, Hamilton Beach’s two-way machine aims to offer the best of both worlds. There’s a single serve dispenser on one side, and an insulated carafe on the other. If you’re looking for a machine to keep a carafe warm without burning, Mr Coffee’s Optimal Brew is worth considering. It has no hotplate, but relies on a double walled, stainless steel carafe to keep your brew hot. 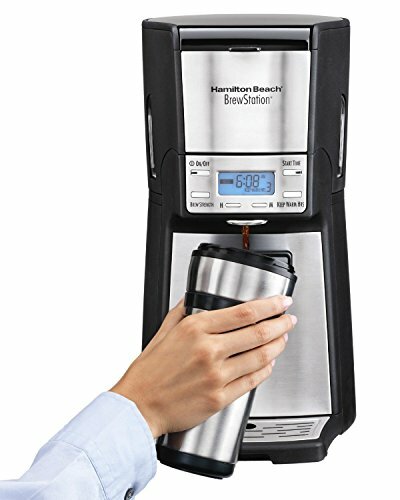 The Hamilton Beach BrewStation is a great option if you want a full carafe of coffee that stays fresher for longer. Remember, though, that there’ll still be some compromise with flavor and temperature if you leave it for hours before drinking. It’s an attractive machine at a reasonable price. Just make sure you have space in your kitchen to accommodate its height. If you’re ready to take the plunge, you can find more details here.